A UK-based climate change expert has warned that there will be an exceptional change in the temperatures in Pakistan as a whole in the coming years, but that the province of Sindh will be less affected as compared to the other provinces of the country. Karachi may however face the threat of rising sea levels by the year 2100, at about 8 feet below sea level. The UK-based climate change expert said that climate change could influence monsoon dynamics and cause summer precipitation levels to drop, as well delays in the start of the monsoon season. While another report said that the impact of climate change in Karachi will deepen by 2030. Due to global warming the coastline of Karachi is likely to be flooded due to rising sea levels. Many seminars and public gathering are held in the city to make the government and public fully aware of global warming, speakers at the seminar have urged the government to prepare long and short-term plans to reduce the impact of global warming on natural resources. Karachi also faces the threat from super cyclones which are said to increase their intensity and momentum in years to come. Cyclones that form in the Arabian Sea do not usually hit Karachi or the Sindh coast, during 1902, 1907, 1944, 1964, 1985, 1999, 2007 and 2010, cyclones made landfall in the Sindh coast including Karachi. Other cyclones that are listed below caused rains as remnants. On 12 June 1964, a deadly cyclone made landfall near Karachi. On 15 December 1965, a powerful cyclone slammed the city with 10,000 casualties. In May 1985, a cyclonic storm made a landfall in the eastern direction of Karachi. The cyclonic storm in 1985 which was moving towards Karachi actually had weakened over the sea while still a few 100 Kilometers away south of Karachi. In November 1993, a category 1 cyclone approached the Sindh-Gujarat border but dissipated due to high vertical shear over open waters. In June 1998, remnants of the category 3 Gujarati cyclone (the 5th strongest cyclone of the Arabian Sea) killed 12 people near and in the city. 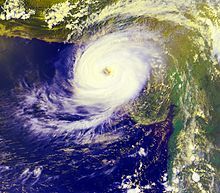 In May 1999, again a category 3 major cyclone (the 4th strongest cyclone of Arabian Sea) hit near the city; this Cyclone killed 700 people in Sindh including Karachi. It is the strongest cyclone recorded in Pakistan. In May 2001, the powerful category 3 cyclone (the 3rd strongest cyclone of the Arabian Sea) hit the Indian border of Gujarat. It caused rain along the Sindh coast, but no damage was reported. In early June 2007, Super cyclonic storm Gonu (the most strongest cyclone in the Arabian sea) caused strong gusty winds in the metropolis with light rainfall as the storm was moving towards Oman. In June 2007, a cyclonic storm, Cyclone Yemyin, passed near the city and killed 200 people before moving towards Balochistan where it killed 380 people. In June 2010, Cyclone Phet (the 2nd strongest cyclone in the Arabian Sea), once a powerful category 4 cyclone, made landfall near the city as a weak tropical depression, with a total 14 casualties in and near the city. In November 2010, remnants of Cyclone Jal caused drizzle with dusty winds in Karachi while it caused light to moderate rainfall in southeastern Sindh. In November 2011, the outerbands of cyclone Keila brought drizzle to the city while moderate showers to the Makran coast. On 7 August 1953, the city received its record-breaking 24 hour rainfall causing widespread flooding about 278.1 millimetres (10.95 in) rain was recorded. On 1 July 1977, Karachi received its third highest rainfall of 207 millimetres (8.1 in) in 24 hour, it caused massive flooding in the city and killed 248 people in the city. In 2003, massive flooding during monsoon season devastated the Sindh, two days of rainfall of 284.5 millimetres (11.20 in) created havoc in the city. In 2006, after two year of drought period heavy rainfall lashed the city during the monsoon season, but the city came to standstill on 17 August when widespread rainfall of 77 millimetres (3.0 in) created flood-like situation in the city killing 13 people and submerging roads, low-lying areas and underpasses with rainwater. 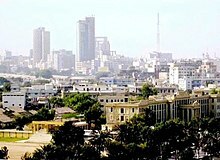 In 2007, almost all the rains that occurred in this monsoon season brought flooding with it, During the month of June Cyclone Yemyin created havoc in the city from 21 June to 26 June 2007 110.2 millimetres (4.34 in) of heavy downpour was recorded which killed 228 Karachiites on 23 June, then from 9 August to 11 August a strong tropical depression brought massive flooding in the city with 191 millimetres (7.5 in) of rain killing 21 people and submerging low-lying areas and underpasses. While on 22 August a monsoon depression once again flooded the city with 80 millimetres (3.1 in) of rainfall killing 10 people. On 18 July 2009, there was severe flooding due to a tropical depression, in which city’s second highest rainfall of 245 mm (9.6 in) occurred in just 4 hours, killing 20 and injuring 150 people. Another flooding event occurred on August 31, 2009 when a well-marked low pressure was present over Sindh, the rainfall was recorded to be around 147 mm (5.7 in). On September 13, 2011, life was crippled in the city due heavy rainfall that caused urban flooding in the city. The rainfall was recorded to be around 145 mm (5.7 in). Drought-like conditions in the city are not common but if the Monsoon season fails to deliver rains then drought emerges. Following are some of worst drought in Karachi city. The major drought in Karachi as well as for whole Pakistan was from 1996 till 2002, peaking from 1998 till 2001. While in 2002 drought conditions started to dissipate. The drought of 1998-2001 was considered worst in 50 years. In 2004, no rain occurred in the city as well as in Sindh province but during the month of October heavy downpour lashed different parts of Sindh due to Cyclone Onil. In 2005, the drought conditions continued, but a post-monsoon low pressure dumped heavy rains during 12 and 13 September. In 2009, drought conditions emerged during the summer season in suburban areas of Karachi, due to El Nino phenomenon and caused drought during the winter season but the monsoon rains of 2009 were above-normal. Windstorms generally occur when a monsoon system or tropical storms is moving towards the city, However dust storms sometimes occur in winter seasons due to Western Disturbance. Dust storms also occur before the onset of monsoon season, they are locally known as Andhi in the country. Following is a list of windstorms as well as dust storms that occurred in the city, however windstorm generated by a tropical storm is not mentioned in this list. *On September 1, 1926, A windstorm hit Karachi but not much is known about this storm. *On May 31, 1986, A blinding dust storm hit the city for 15 minutes that toppled trees and advertising signs, overturned vehicles and tore down electrical wiring. It reduced visibility to near zero and blew down flimsy wood and bamboo shanties in Karachi, at least 11 persons were killed and more than 250 injured. The dust storm of 67 mph (108 km/h) occurred due to the interaction between the strong cold airflow and monsoon depression present over north western Gujarat. *On July 4, 1994, a windstorm generated by monsoon low pressure system killed 26 people in the city. *On June 23, 2007, a massive dust storm hit the city followed by a heavy downpour, the interaction between a strong low pressure system and the outer bands of Cyclone Yemyin which was still over western india as a tropical depression caused 69 mph (111 km/h) windstorm that uprooted billboards, trees, traffic signals and caused 200 deaths in the city due to the collapse of roofs of many houses in the port city. *On February 22, 2008, a dust storm struck the city which reduced the visibility to merely 500 metres, the dust storm was due to the westerly winds that were coming from the desert regions of Balochistan. *On March 19, 2012, a mild dust storm hit the city that caused 65 km/h winds to blow in the city while the visibility dropped to just 200 metre. *On May 19, 2012, a weak dust storm gripped the metropolis with highest wind of 72 km/h.